Which day could have been more suitable for language diversity to promote linguistic diversity and multilingualism than the European Day of Languages? 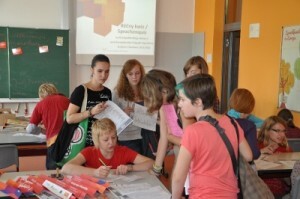 On 26 September 2012, the European Day of Languages, the language diversity team visited the Sorbian school and meeting centre in Bautzen/Budyšin in Lusatia. In the context of the intercultural week of the district of Bautzen/Budyšin, the Day of the Slavic Cultures took place there. In four different stages we introduced the school students of all age groups to this subject in a playful way, with an emphasis on Slavic languages. For this purpose we prepared two versions of a language quiz in both German and Sorbian – for children and for youth or young adults. The quiz tested the knowledge of school students in regard to languages, but also their associative abilities. 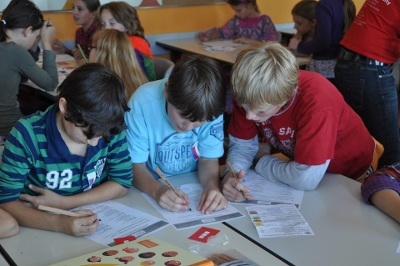 In a joint evaluation of the quiz together with the school students, the language diversity team could explain the right answers in detail. Apart from the quiz the school students also had the opportunity to learn the Morse-alphabet and get a practical introduction in international Morse code, as also Morse is a way of communication, a “method to convey letters and signs”. The school students were given the task to decrypt a Morse code that we had given to them (rěč / Sprache / language diversity), and later to write a code themselves, which they think of when hearing the word “language / languages”. The European Day of Languages is celebrated each year on 26 September on the initiative of the Council of Europe in Strasbourg. The European Day of Languages was introduced in 2001, the European Year of Languages. Currently the Day is used for actions in 45 countries. The purpose of the action day is to increase the appreciation of languages and cultures and to promote multilingualism all over Europe based on the conviction that linguistic diversity can contribute to better understanding between the cultures and that it belongs to the essential elements of the cultural heritage on our continent. On the occasion of this day many activities are organised across Europe: actions for and with children, TV- and radio shows, language courses and conferences.